Delivering the technologies, processes, tools and expertise to quickly translate designs into reality. 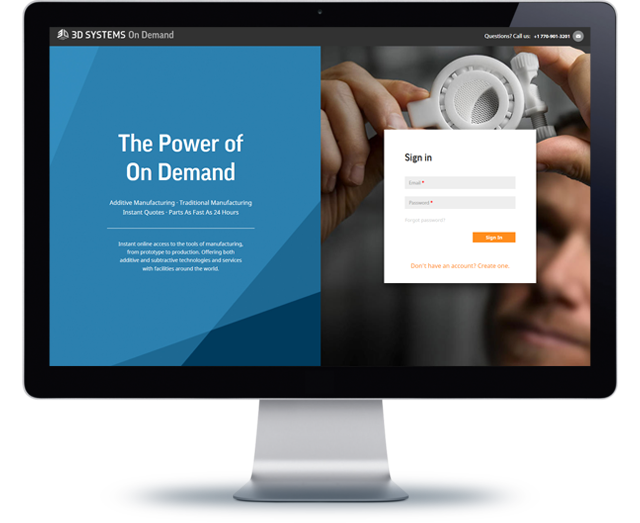 We expanded our Quickparts Rapid Prototyping business and changed our name to 3D Systems On Demand to better represent our upgraded suite of full-service advanced additive and subtractive manufacturing services. With more combined years of service in additive and traditional manufacturing than any other service bureau, we are driven with a relentless pursuit of turning your designs into reality. We offer a full ecosystem of manufacturing technologies including, Functional Prototypes, CNC Machining, Sheet Metal Production, Injection Moulding, and Investment Casting. We provide professional-grade online 3D printing and manufacturing services that empower designers and engineers with the tools to design, iterate, and produce quality parts directly from digital 3D files. We offer customers easy access to the widest range of 3D printers and materials with 24/7 online ordering, a digital order management console, and production in as fast as one day. Learn more about our new 3D Printing Portal here. No other global service bureau in the industry offers the complete suite of manufacturing services the way we can. From 3D printed prototypes to final production, we provide additive manufacturing services such as Stereolithography (SLA), Selective Laser Sintering (SLS), and Direct Metal Printing (DMP) as well as subtractive technologies, such as CNC machining, injection moulding, sheet metal, and our proprietary QuickCast Investment Casting.